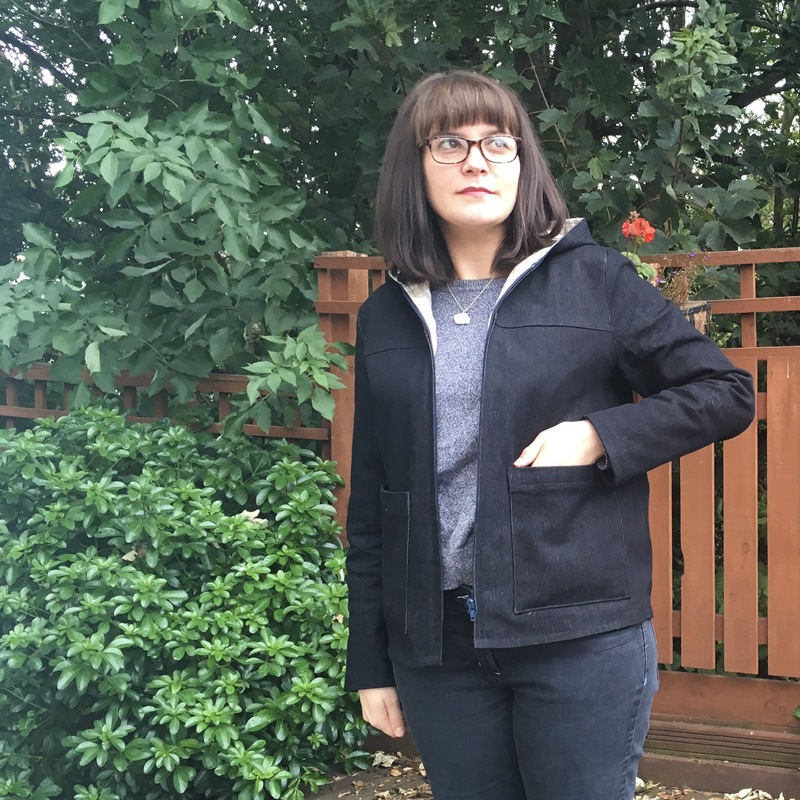 The eternal quest for a mid season jacket was not as eternal as I had expected. 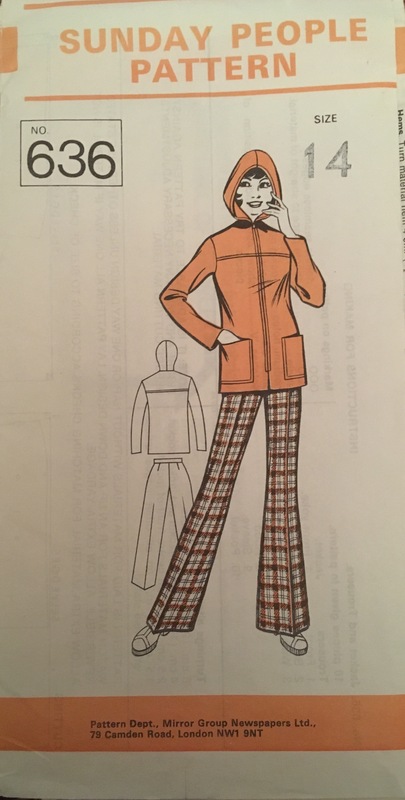 I had high standards, I wanted a country mouse coat that looked like a city mouse coat (if you’re confused google the country mouse city mouse story). Or in plain English it needs to be functional and pretty. 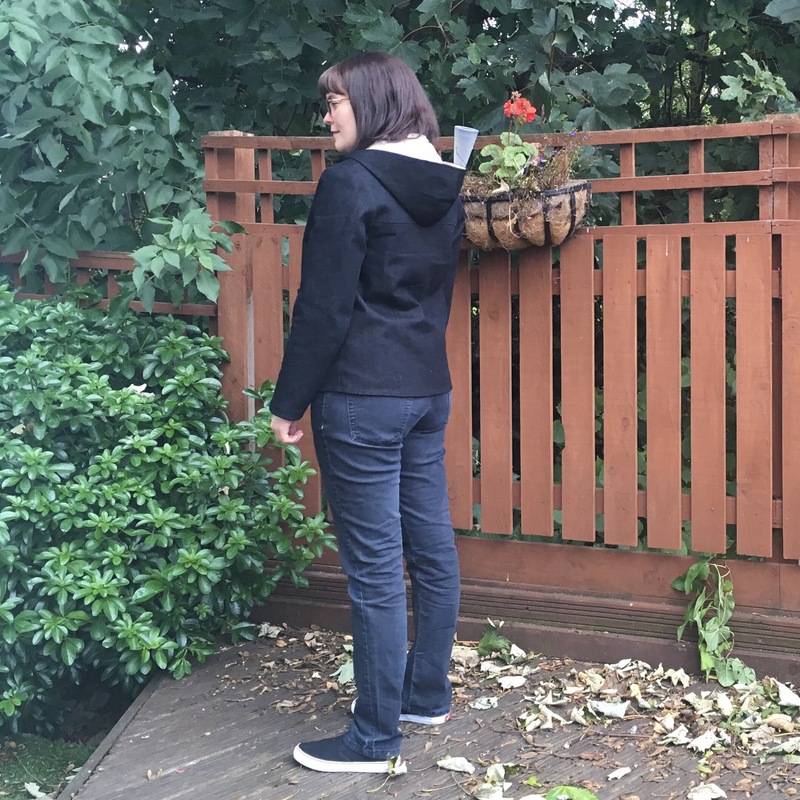 I wanted a hood, I wanted it to be just waist length, I wanted nice big pockets… Is any of that too much to ask for? Check out those groovy trousers! So yeah this one looks perfect, asides from the 36″ bust… I take a 34″. So… against my usual tendencies… a muslin was required. But there was still a small obstacle to overcome.. the vintage part of the pattern. Each piece was not printed, it was numbered with punched holes, had the usual wedge markers… and then yet more holes to indicate the rest. This took some… translating. So tracing done, and muslin done showed me that the shoulders were indeed too wide. 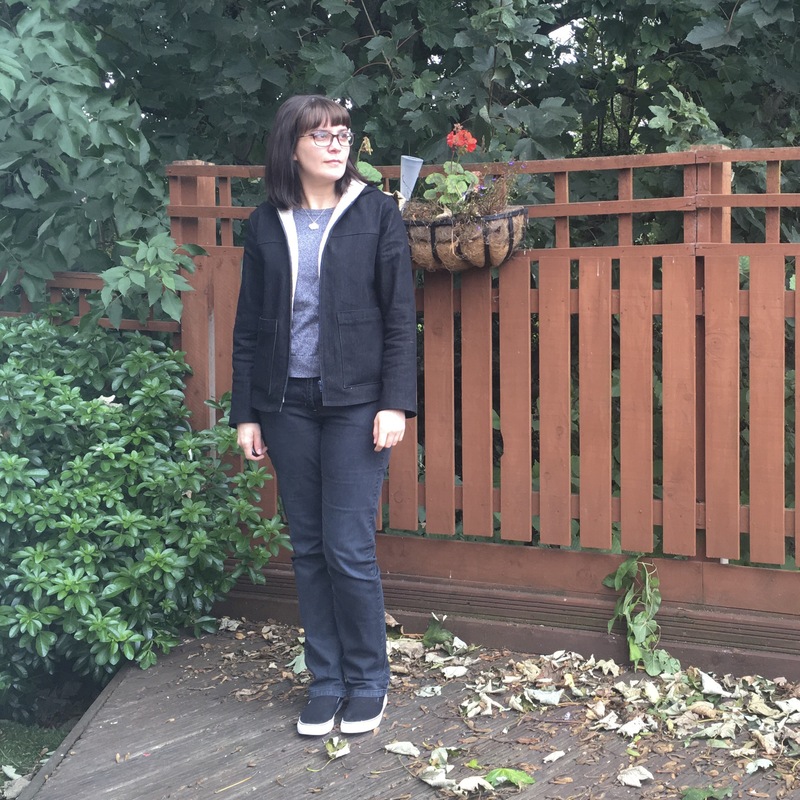 I used my French curve to shave off those few inches, then went for it in my final fabric choice… which was a very lovely 10% stretch indigo denim from Fabricland. The stretch isn’t important really, but it was a good weight and a lovely colour. Yay trying to photograph dark clothing! At least I now have a lovely garden to take photos in. But hey… they’re still huge! So I like that. 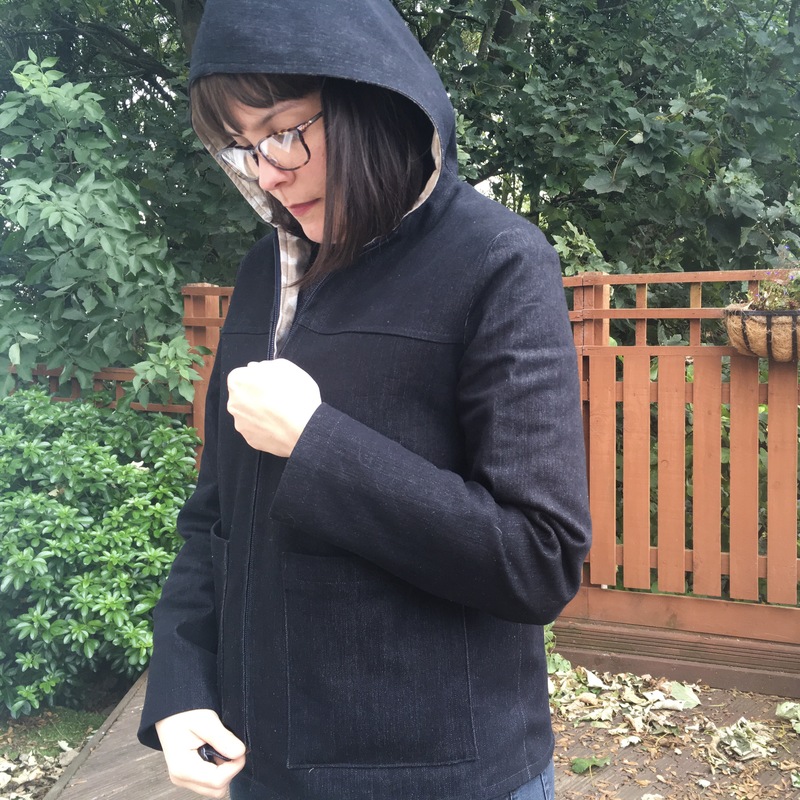 This was also my first go at sewing in an open ended zip… my word they’re so much easier than regular zips! 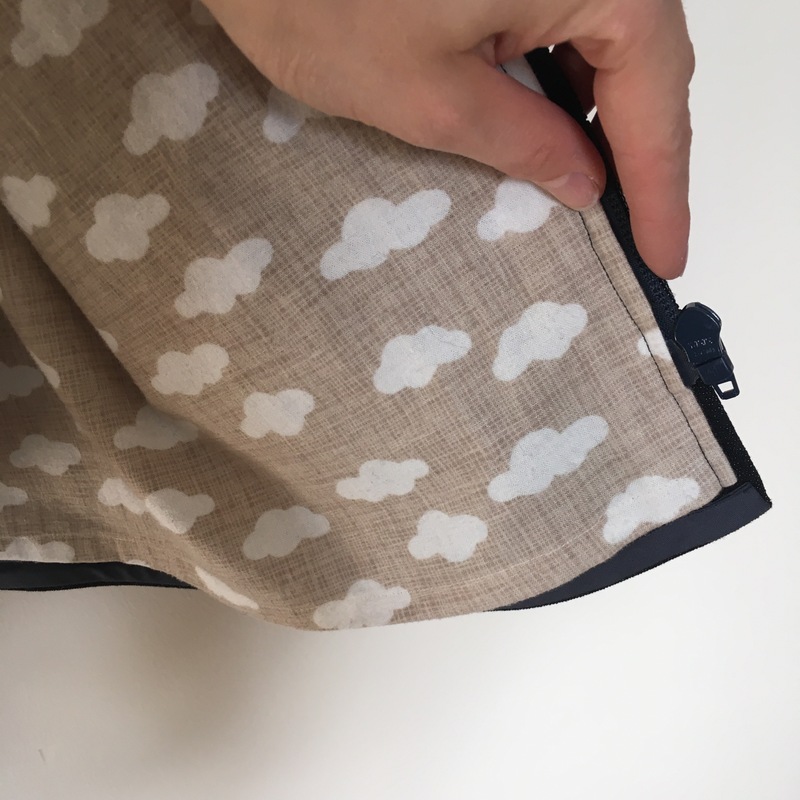 I lined the whole thing with adorable cloud brushed cotton (for cosy reasons), but I did add a satin lining in the sleeves so it slides over my jumpers ok… with the brushed cotton sandwiched in between. The lining was a bit of a mare to attach, the hood went on first, then it was top stitched down the front (the whole thing was hemmed first), then I sort of tucked the sleeves in and kind of top stitched using bias binding. I’m still a little scared of bagging the lining, and the hood part hurt my brain so I think I took the easy way out there. Plus the hems are designed to hang separate. 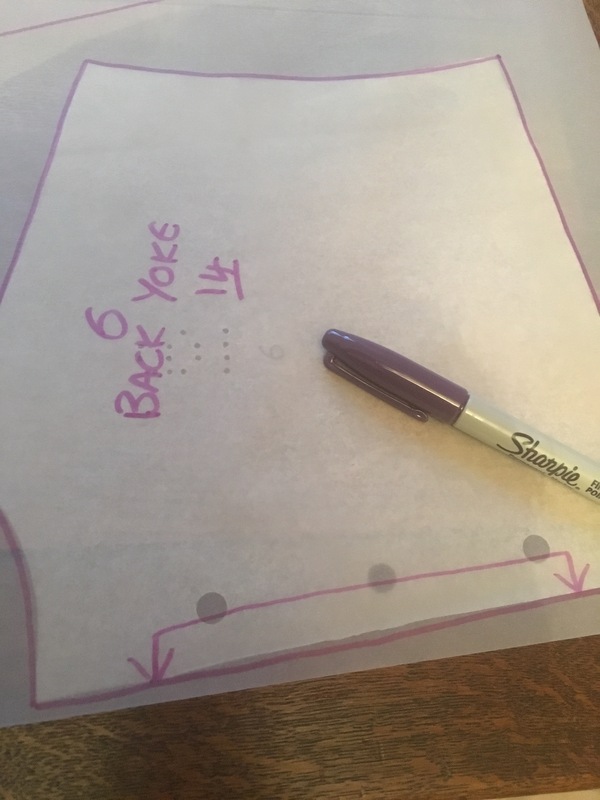 I just added tacks at the side seams. 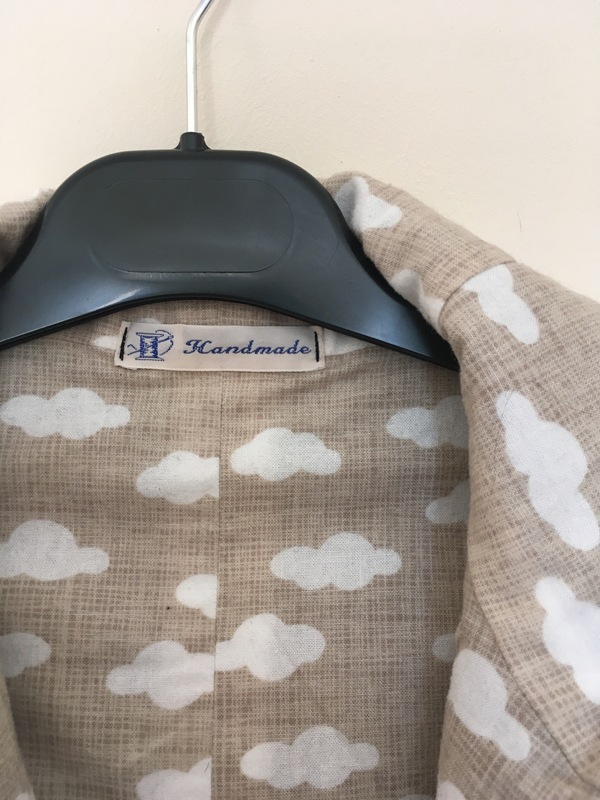 But look at those cute clouds in my raincoat! I love having a hood! But would you believe that since finishing this I’ve never been rained on!! The injustice!! 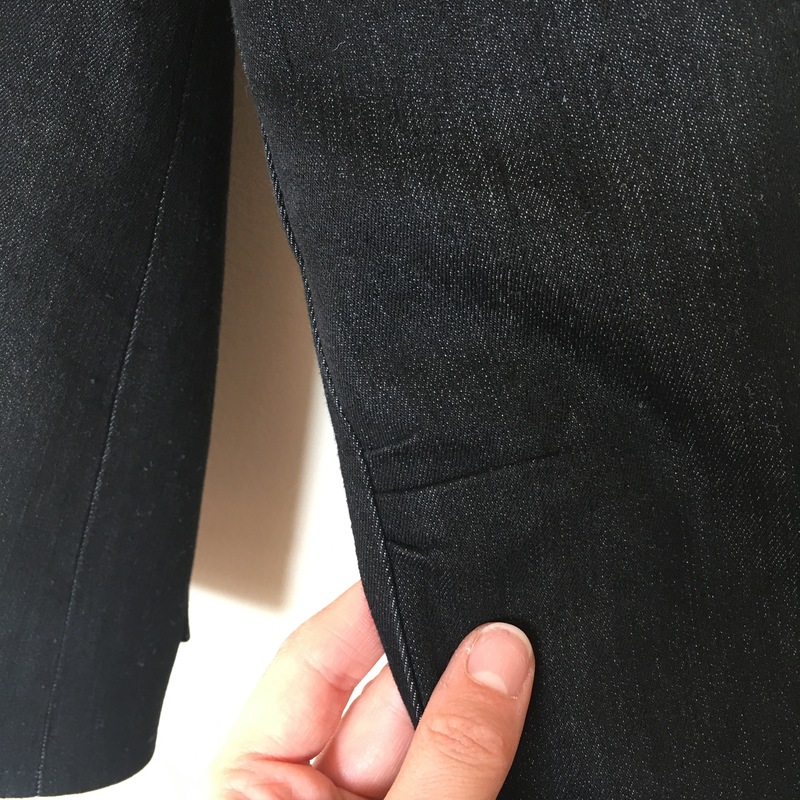 There are tiny little pleats on the elbows which make the arm bending more comfortable, the whole sleeve curves slightly in the natural shape of the arm. I love it! 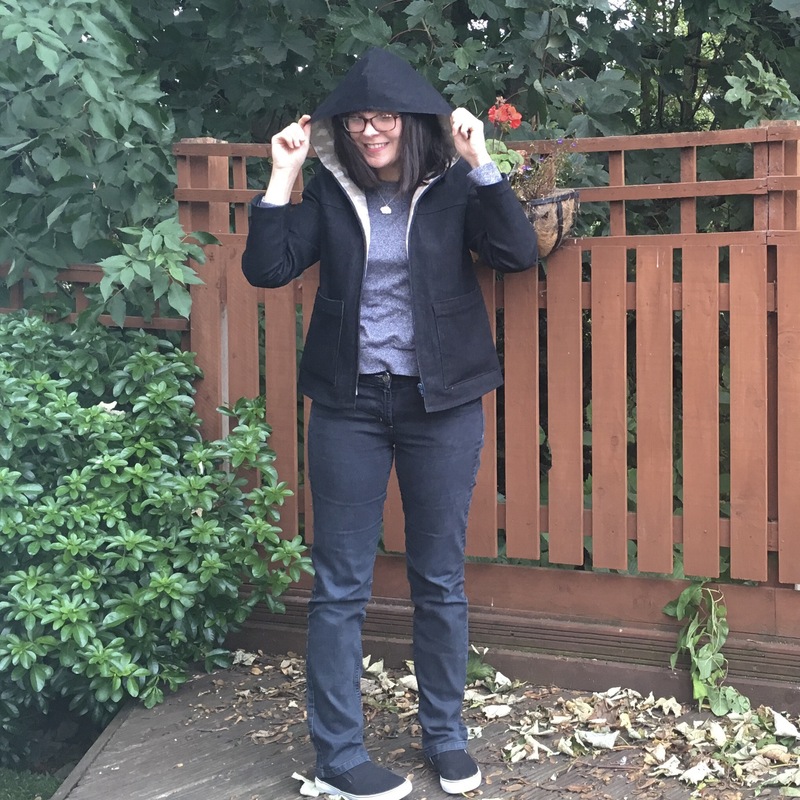 The big issue I have with the jacket is that the hood doesn’t cover my fringe! I actually had to shave off the crown a bit as it turned out a little KKK (NOT ok!!!) but I think it should have come out a little more at the front. Hey, you live you learn. So this is technically my first piece of my winter collection… but I’d already finished it so it didn’t get added to my list… that’s cheating. 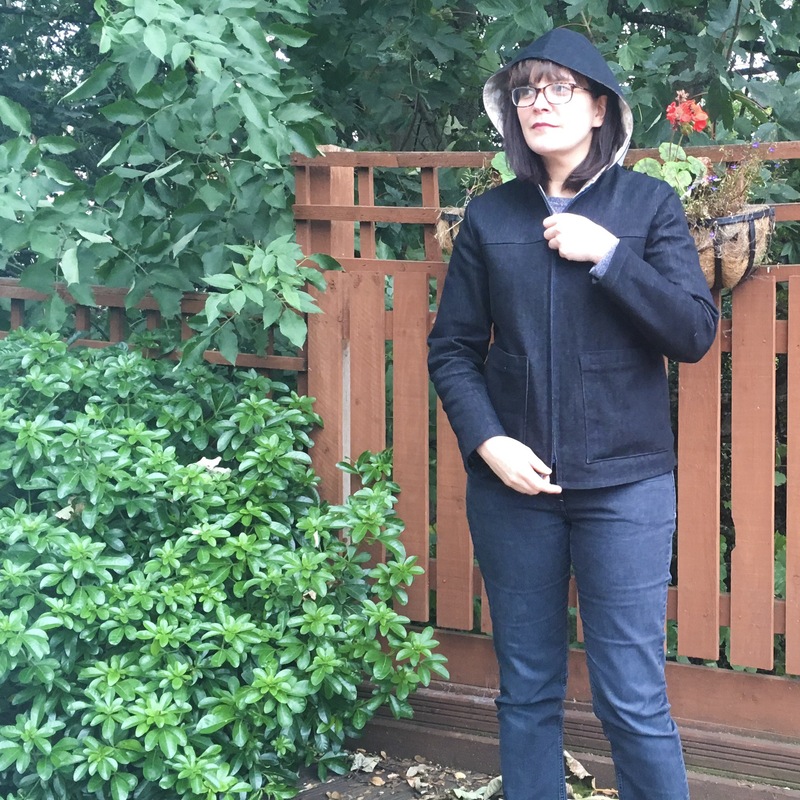 Ha ha… I look like I have a solar lamp sticking out of my hood!